Over the years of outdoor adventures, I have amassed a nice collection of outdoor stoves, covering a range of fuel types and cooker designs. I thought it was about time I put them to the test! The test was rather unscientific and consisted of measuring the length of time taken to boil a ‘cup’ of water (approximately 250 ml). Each cooker was lit and the time started once the boiling vessel was placed on top. The time was stopped either when the water started to visibly bubble over, or the fuel ran out. Cost per boil: £0.15 approx. This cooker was bought for me by my parents 17 years ago. At first, it was all I used when camping, and the Trangia is a robust workhorse for group trips away with few failure points and a versatile and affordable fuel option. I have resurrected this stalwart of cooking after about 10 years in the garage and plan to use it in situations where I don’t have to carry the set very far! BCB Fire Dragon II – Latest 2015 version of the classic metal mug cooking system. What an upgrade to the age old and reliable cookset. Larger mug and cooker, but the main advance is the upgrade in fuel. Jumping on the bioethanol bandwagon, BCB have ‘gel-ivied’ their fuel either into almost solid cubes (as tested here) or into bottled gel form. The fuel tablets are rumoured to be the British Army replacement to the dirty examine based solid fuel which has been issued for decades. Not the fastest cooker to boil, but with an easy to transport and use fuel system, and the versatility in fuel options this cooking system is a great alternative to anything more complicated. The ability to store the water bottle inside the mug and cooker is great for reducing bulk and space. NB: It is possible to use a spirit burner with this cookset, increasing its versatility. 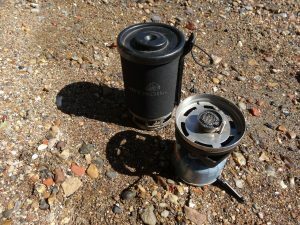 Jetboil – The original all in one super quick gas cooking system (purchased 2006). Since coming to the market about a decade ago, I have been impressed by Jetboil systems. They do offer a lot, especially for the lone traveller. A neat system, very quick to boil water, but where I do find they struggle is simmering meals or water being cooked (this problem is addressed in the new models) and also for catering for more than one person. Saying that, if you want a cooker that you can deploy in seconds and prepare a group brew in less than 5 minutes, this is your one stop shop. I only use mine for boiling water, and heating boil-in-the-bag meals, I couldn’t be convinced to use it for anything else, but it almost always comes with me. 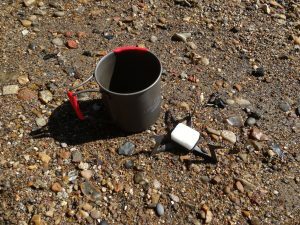 *Jetboil quote 2.5 min per 0.5L of water boiled, and 12L boiled per canister of gas. Fuel cost for this boil was an educated estimate, but nothing more scientific than that. Fuel cost per boil: £0.20 approx. 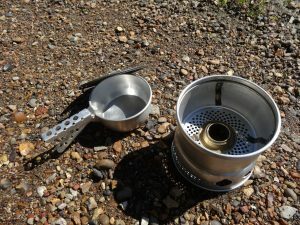 Pre-Jetboil, this was the gold standard in convenient and powerful gas stoves. And in some ways, there are situations where I much prefer the versatility and light weight of this burner. Used with an oversized titanium mug, large enough to store the cooker itself and some drink powders, this is a great day trip combination, but the cost is pushed up when you take into account you need a cooking pot or mug. 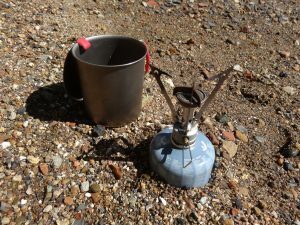 I use the SnowPeak 0.5L titanium trek mug (£25.00) with this cooker and it gives a performance close to the Jetboil in a smaller and lighter package. This flameless cooking system has all the potential to be an excellent piece of equipment. 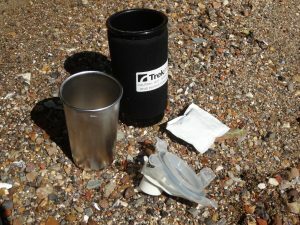 The heat generated is immense for a water activated chemical pack, but the mug and metal liner are a heavy and clunky combination which take over 10 minutes to adequately warm a drink, and even then it isn’t hot enough to brew a coffee of cup of tea. It makes for a nice warm hot chocolate though. As much as I want to like this little cooker, I struggle. The Esbit solid fuel hexamine fuel blocks are tiny and don’t burn with any great heat. The result is a slow and underpowered cooking system, but the cooker only weights 13g. The upside is that the cooker is strong and light and is able to accept many different fuel types, I have even tried this with bioethanol gel fuel, and while you need to top it up more frequently due to the small fuel holder, it works well. 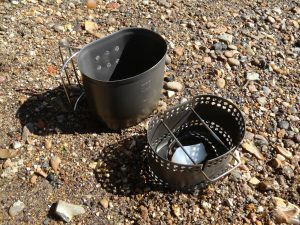 I am really pleased with the FireDragon II cookset and will carry this in my webbing as an ‘in the field’ solution to heating water and cooking. The Jetboil is a solid contender and has the fastest boil time, and for this reason it will find a home in a daypack for winter walks or anywhere else I find myself brewing hot drinks in a rush. The Trangia will definitely stay in the car for group camping sessions, it just cant be beaten. The Pocket Rocket, this will be my lightweight Jetboil alternative where space and weight is critical. Sorry TrekMates and Esbit, you just don’t do it for me. Frontline Ulster is a website dedicated to tracing the physical remnants of conflict left within Northern Ireland and Ulster through all eras ranging from the early Home Rule crisis through to the cessation of hostilities and the ending of Operation Banner, the longest deployment of the British Army in history. The site aims to focus on the physical archive and archaeological evidence, with less focus placed on the human or political impact. Image copyright is retained by the author unless otherwise stated, and where possible the source has been referenced. Inclusion on this site of any location is not an implied right of access; always attempt to seek landowner permission. No site is safe, always take care and be mindful of any hidden hazards.